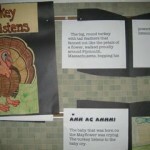 This amazing teacher worked with her students to put together a Thanksgiving-appropriate story using the structure of Crocodile Listens. 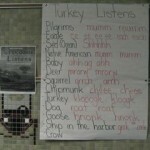 See what happens when turkey listens! 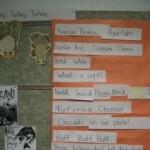 They also created a turkey chant using the chant books as a structural element. Mrs Schwartz is clearly an extraordinary teacher. 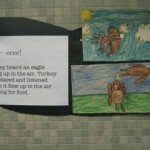 These are actually breeds of turkeys, apparently. 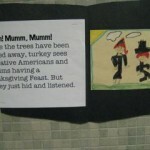 They set the story when the pilgrims arrived! 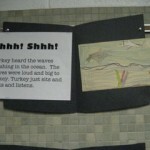 They imagine what the turkey heard! 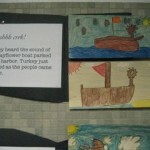 Creating the stories touches many kinds of descriptive writing. This writing is early elementary. Wow!